I have a very fat toad that lives near my house – see the picture on the right. I was looking at him (or her) after a walk the other day, and I realized that as toads go, my little friend was very successful. That got me thinking. Why was my friend so successful? I realized this toad could teach me a lot about small business marketing, and I want to share those lessons with you. Business is all about location, location, location, right? It’s important to be at the right place at the right time. If you have a physical store, you want to be at a good intersection, where there’s a lot of traffic and it’s easy to get in or out. Not only that, your ideal customers have to frequent the area. Online, it’s much the same. I say the same thing over and over, it seems, but so many small business owners miss it. You do NOT have to be on all social media. In fact, if you are, you are being counterproductive. You’re wasting valuable productive time on outreach that won’t generate any income. Let’s go back to my toad. My building, like many, has a small light above the door. At night, this light attracts a LOT of insects. My toad discovered this, and camps out there every night. There are a lot of insects in my part of the world. But the toad isn’t successful because she spends all her time jumping around chasing every bug in the area. She’s successful because she found where the bugs go, went there herself, and stayed there. Now, please don’t start eating your customers. But the same principle applies – where are your most valuable, profitable customers? Go there, be there consistently, and reap the rewards. My friendly toad (now I’m humanizing her, smh) doesn’t hang around my building during the day. Even in Iowa, it’s still hot during this part of the year. But most importantly, the bugs don’t hang around my door during the day! The light-in-the-dark element isn’t there, so the bugs don’t hang around. And neither does the toad. If you wanted to pursue your customers every day, you could spend 80 hours a week just doing that. Walking around your town or surfing around the internet, trying to find one more prospect to talk to, is a full-time job. But is it value added? No! Instead, research the best timing for you. Depending on the social media outlets your best clients frequent, there will be days and times that are most important for posting, interacting, and more. Your ideal client base will also let you know how often to blog, share, and email without overwhelming them. You’ll need to test different ideas, but you’ll find the sweet spot. Once you find it, make it a daily routine. My little toad needs to eat every night. As a result, she will be at my door – the sweet spot – every night. That’s consistency. Too many businesses, even when they do decide on a social media outlet and strategy, falter after only a few weeks or months. Some do a quick run and when they don’t get sensational overnight results, they lose interest. Others never make their routine part of their daily or weekly schedule, and find they never have time to keep up with social media. Once you know your location and have found your timing, you need to make it consistent. People don’t build trust and business relationships on a single interaction, tweet, or Facebook post. You need to consistently be in their sphere of influence before you become the authority that you’re striving to be for them. Once you build trust over a number of interactions over time, you’ll be able to invite your prospects into a deeper relationship. Hold a webinar and invite them to join your email list. Educate them about an upcoming product once they are on your list, and then invite them to become a customer during the launch phase. All of this nurture-into-client takes consistent interaction – if you “fall off the face of the earth” at any point, you’ll have to start over when you come back. 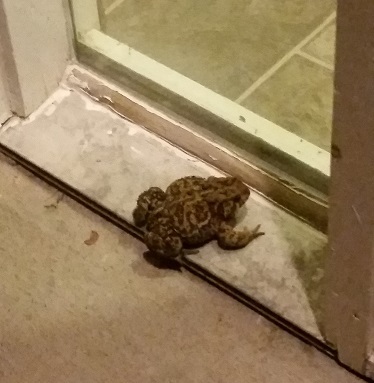 My toad didn’t create her “lead magnet” – the light above the door – she just found it. Notice that it’s very simple, but very effective. You don’t need honey, jam, flowers, or trees to attract these bugs. A light in the darkness is an irresistible beacon to them. Sometimes you can be like my toad and simply stumble on an existing lead source. Perhaps an active Facebook or LinkedIn group in your niche will give you more relationships than you can handle. Perhaps there’s an existing Reddit for exactly your type of people. If that’s the case, don’t complicate things – just go there and build the relationships that come to you. Other times, you will need to create a lead magnet. Once again, simplicity is key. What is the one burning desire of your prospects? What’s the one irresistible beacon that will draw them in? Don’t take a lot of time creating a multi-faceted project or a 75 page white paper when all they want is a list of key productivity apps. You’ll notice that the simpler your draw-in is, the more effective it will be. There’s something about a simple, focused approach that makes an already attractive piece even more magnetic. When it’s complex, it’s overwhelming and some prospects will be turned off. When it’s simple, it’s tantalizing and easy to consume. My little toad is living a great life for a toad. She’s fat and happy, with an all-you-can-eat buffet every night that doesn’t require any attention from her during the day. You can learn a lot from this toad. Now the question is – what’s next for your clients? Need help implementing marketing strategy for your clients? Contact me today!